Address: Cemetery Road, Pahoa. As you travel down highway 130 and pass the police station you stay straight while highway 130 veers to the left. In just a quarter mile turn right on Cemetery Road. Travel another quarter mile and the street turns left. Right after the turn you will see the transfer station on your right. What is a “Transfer Station” and why would you want to go there? A transfer station is a nice word for a dump. Actually, it isn’t the final resting place for trash, just the location where residents go to dump their trash. Hawaii doesn’t have public trash pick up. Every resident must take their trash to a transfer station, unless they hire a private company to dump their cans (as I do for my Hilo vacation rentals). As in introduction, lava has flowed continuously since 1983 from the “East Rift” zone of the Kilauea volcano. The vent that has been spewing lava all these years is called the Pu’u ‘o’o crater. During those early years, the Royal Gardens neighborhood was wiped out. Starting on June 27, 2014 lava flowed from this crater went in a new direction. Instead of directly East into the ocean, it went north/west, toward Pahoa. On November 13, 2014 lava from Kilauea’s Pu’u ‘o ‘o vent entered the town close enough to burn one house and enter the transfer station (being on the edge of town). At the rate it was flowing, it would have burned down much of the town the next week. The gas station was empty and the tanks filled with foam. The grocery store and neighboring shops were all emptied. 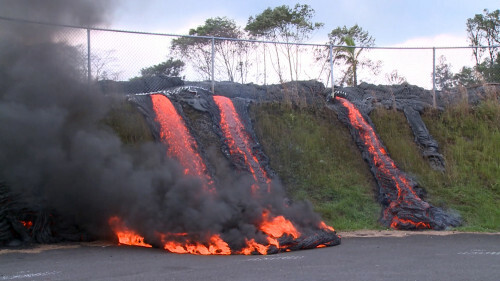 Then the lava stopped. From that time until June of 2016 lave only flowed within 5 miles from the crater safely away from Pahoa. This stop is just minutes above Pahoa and is a great way to see just how close active lava came from wiping out the community and cutting off the main road south.